Too many years ago I ate one of the most delicious meals of my life in the kitchen of one of my dearest friend’s houses. She was living in Athens at the time and we visited her at the beginning of the summer, just before the temperature began to bite. The evenings were long and balmy and her husband came home from work with an enormous watermelon. It was perfectly ripe and tasted like no melon I had ever eaten before. It was vivid, bright and refreshing. 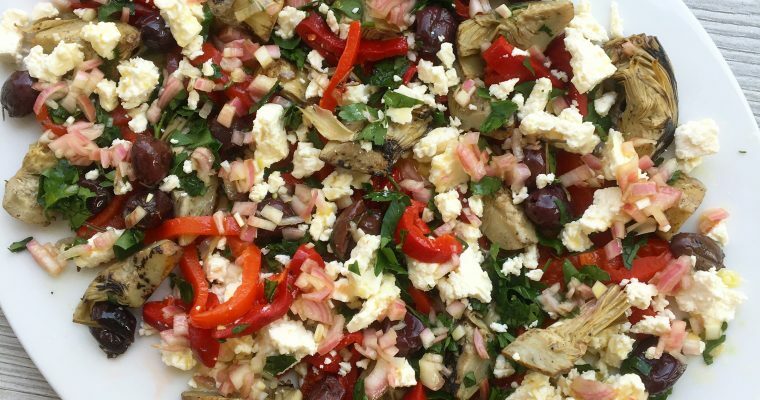 We ate it with some fresh, salty halloumi cheese with a bowl of nuts and lashings of cold wine. It was heaven. A simple but perfect meal making a memory to last forever. When I saw watermelons were being stocked again I of course knew it was unlikely I’d find any as tasty as that one, but they did seem just ripe. 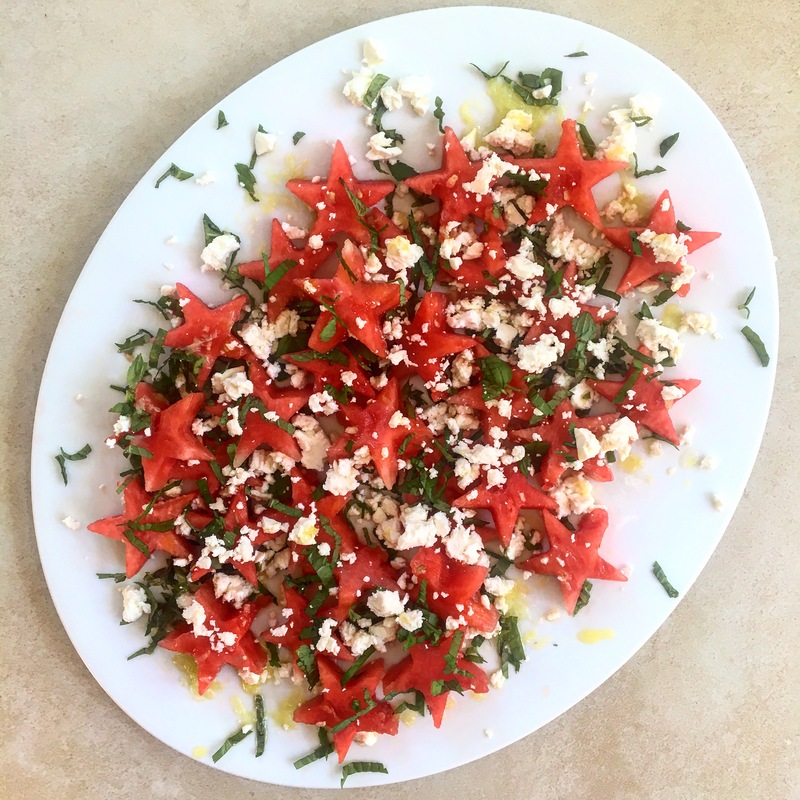 I have made the dish you see in the photo with a seedless watermelon (which my youngest will be thrilled with as he hates picking out the inky black seeds) and it means you can do fun, crazy things like cut out shapes. You can, of course, just cut the melon into chunks as well. Step 1 Cube the watermelon and scatter on your platter. Step 2 Crumble over the feta. Step 3 Take the leaves from the mint stalks and finely chop. Sprinkle over the cheese and melon. Step 4 Make the dressing in a bowl or pot by just mixing together the lime and oil. Drizzle evenly over the rest of the salad. The freekeh salad is delicious. Will definitely make it again. Thanks! I’m pleased you liked it. I love having the leftovers the next day! 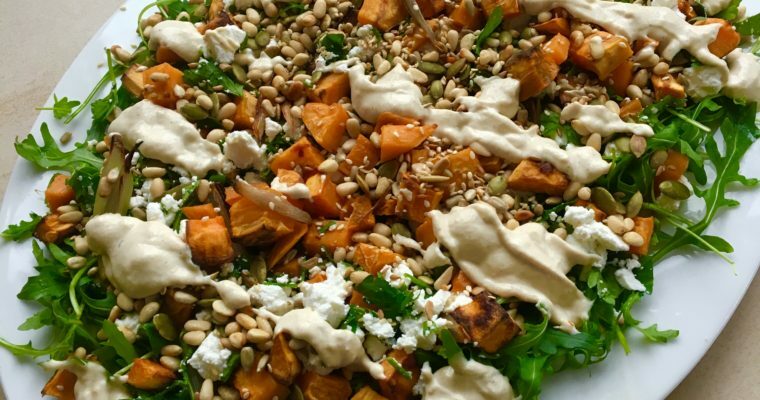 Just made your freekah salad and will definitely become a staple! So quick to make too…. I love that you can change it up with what you have in the fridge already – and it goes with everything!